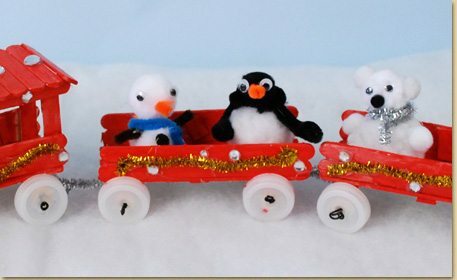 Use Poms, Fuzzy Sticks and Wiggly Eyes to create a penguin, polar bear and snowman as your new wintertime friends! 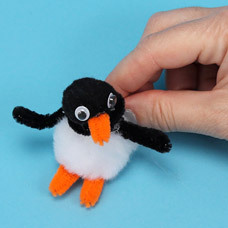 Create the Penguin using a large white Pom as the body and a medium black pom as the head. Glue (2) Wiggly Eyes onto the head to begin the face. Take one orange Fuzzy Stick and cut in (4) equal pieces. Fold a piece to create a small “V” shape and glue onto the face as the beak. Repeat (2) more times to create the penguin’s feet as shown. Save the last piece for a later step. To make the penguin’s arms, cut a black Fuzzy Stick in half. 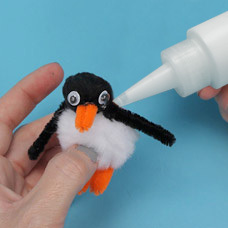 Fold each piece in half and glue to the sides of the penguin’s body. Cut another black Fuzzy Stick in half and wrap around neck to create a finished look between the neck and body of the penguin. 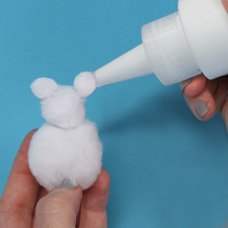 To make the polar bear, glue a medium white Pom to a large white Pom as the base. Glue (2) small white Poms on for the ears. Decorate the face using (2) Wiggly Eyes and a tiny black Pom for a nose. Glue (5) small poms onto the body for arms, feet and a tail on back! Wrap a small piece of a Glitter Stick around his neck as a shiny scarf. 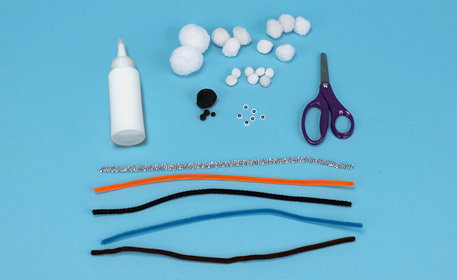 For the Snowman, glue (3) small white Poms together. Add Wiggly Eyes on the top pom to begin the face. Use the last orange Fuzzy Stick from Step 3 as the snowman’s carrot nose. 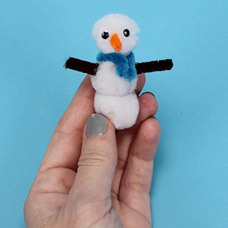 Cut (2) small pieces of a brown Fuzzy Stick to create the snowman’s arms. Use a blue Fuzzy Stick around his neck like a scarf! To learn how to make the Wood Stick Train shown in the photo up top, click here!